The Hermes Playing Card Oracle is Robert M Place’s latest project. 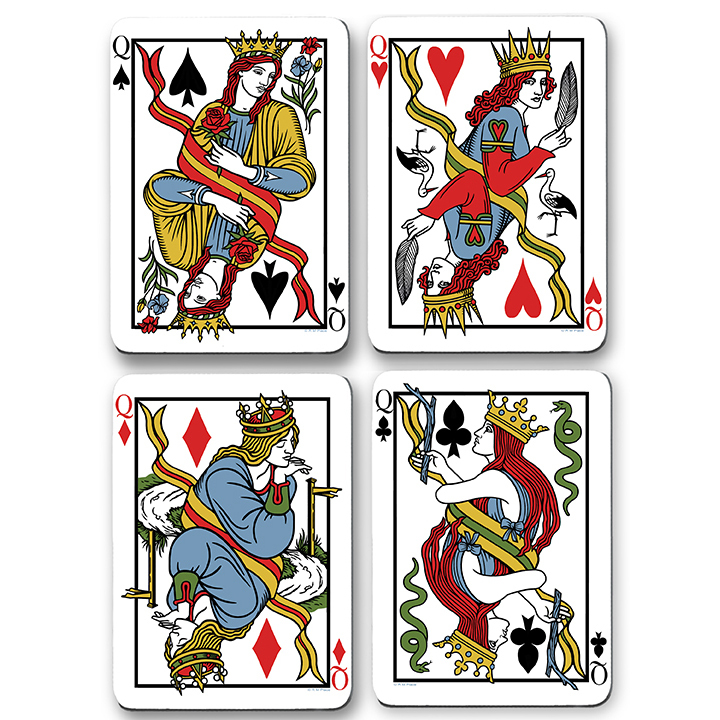 It is a deck that shows that all playing cards are divination cards. And it is designed with the graphic simplicity of the best collector’s card decks. The decks are $20 each, plus $8 shipping for one to eight decks, mailed in the USA. Shipping for Canada is $26 for one to eight decks. Shipping for other international orders is $35 for one to eight decks. Payments can be made with PayPal, checks, or a Visa or Master Card. 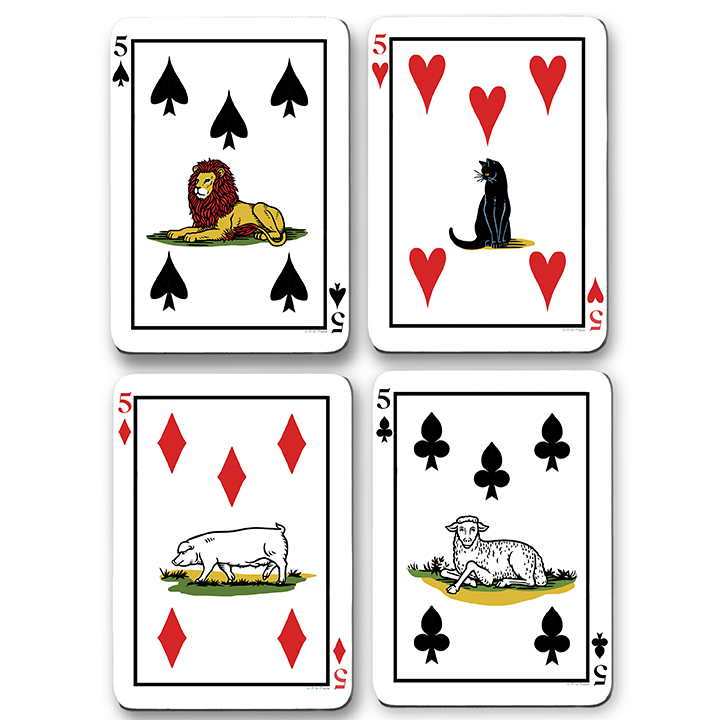 The deck is a 52-card playing card deck with rounded corners, with two additional jokers. Every card has an additional symbolic image added, so that it functions as an oracle deck. The cards measure 3.5″ by 2.5.” A small book explaining the oracle is included in the box. 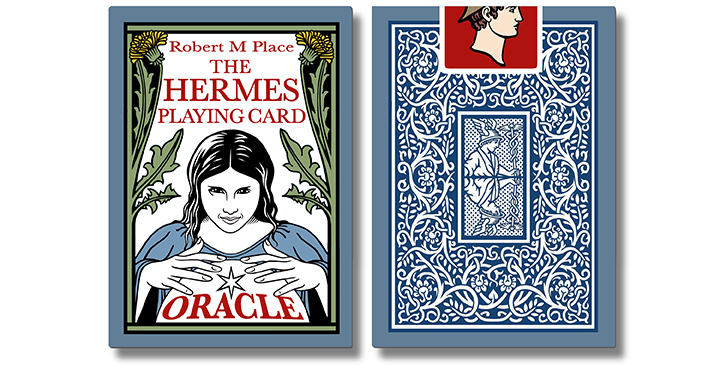 The Hermes Playing Card Oracle is the latest oracle deck designed by Robert M. Place. 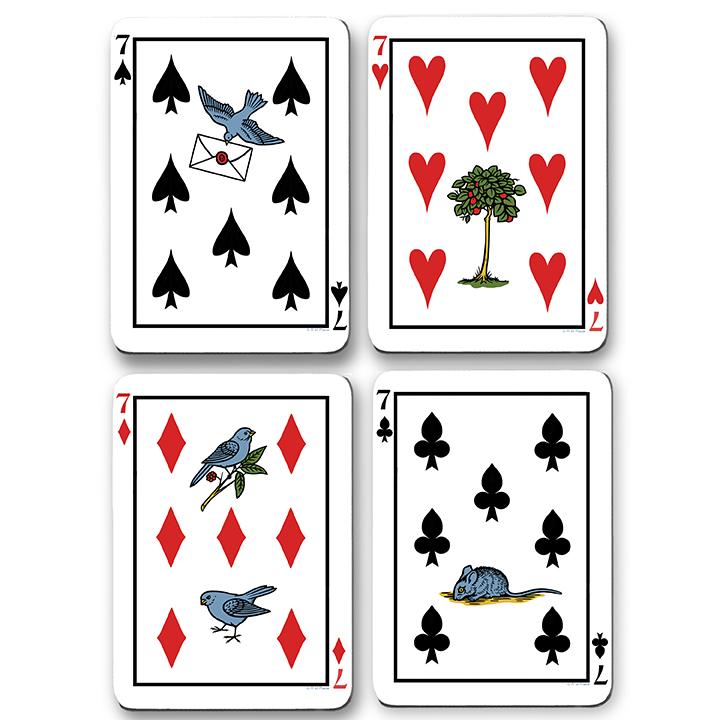 It is a standard game deck of 52 cards plus two jokers, but with the addition of symbolic images on each card, each providing a divinatory meaning. It can be used for card games, or laid out in the traditional pattern, known as the Grand Tableau, and used for divination. 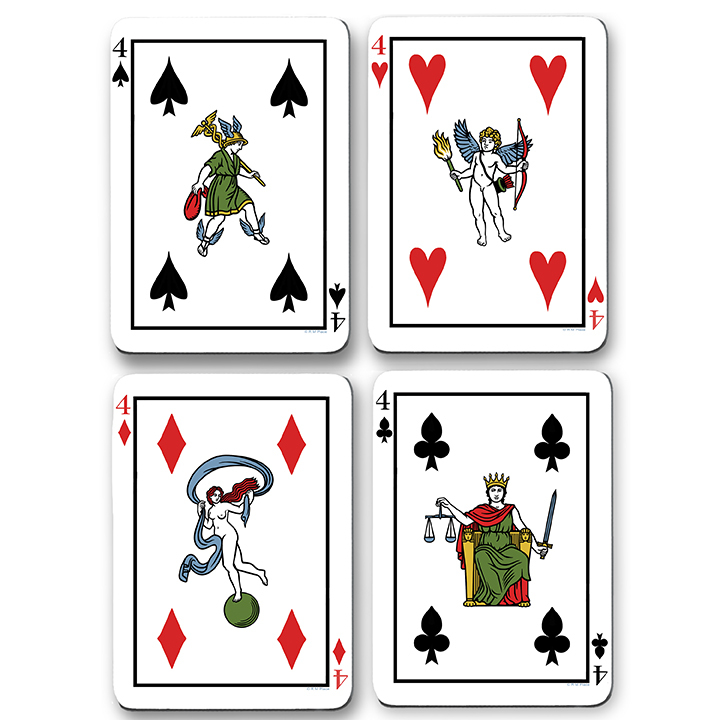 Although the Tarot is the deck that most people today would associate with divination, historically, regular four-suit decks of playing cards were more likely to have been used for this purpose. In the late 18th century, oracle decks were first published in which each card was illustrated with a symbol designed primarily for divination, but a small image of the playing card associated with each symbol was also included on each card. The most popular oracle deck was the Petit Lenormand, first published in Germany in 1847. 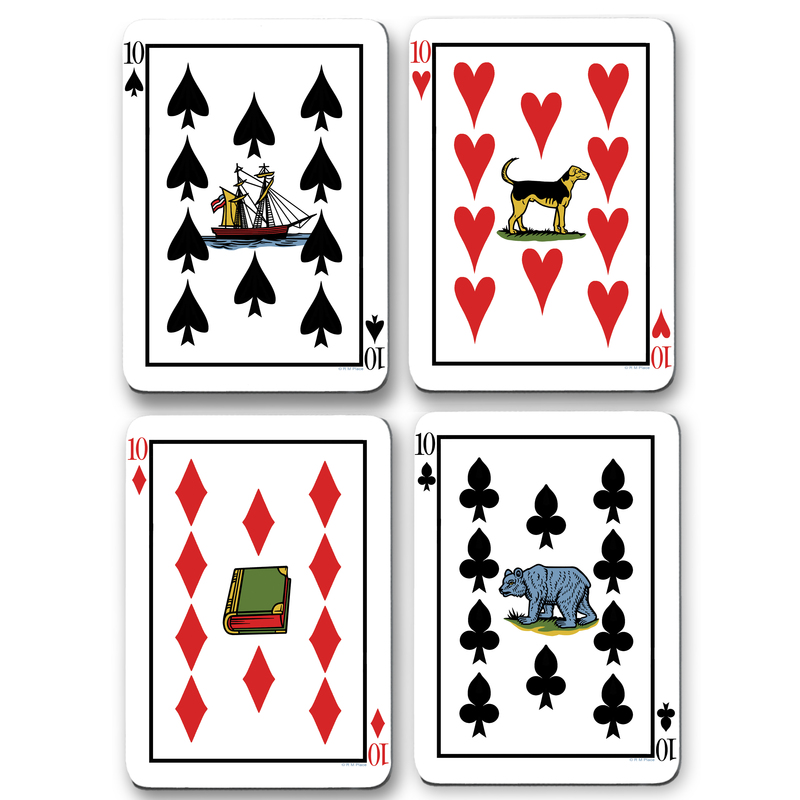 This deck was based on the common 36-card German deck (a deck without the 2 through 5 pip cards in each suit) and a miniature playing card was included at the top of each card. There were, however, many variations of oracle decks produced in the 19th century, including some based on the standard 52-card French deck. The Hermes Playing Card Oracle is like a traditional oracle deck, but instead of each card being dominated by a symbolic image, with only a miniature of the associated playing card inserted somewhere on the card, each card is a standard playing card with the symbolic image inserted somewhere on the card. The symbolic images on each card are ones found in traditional oracle decks, and each has a specific meaning. 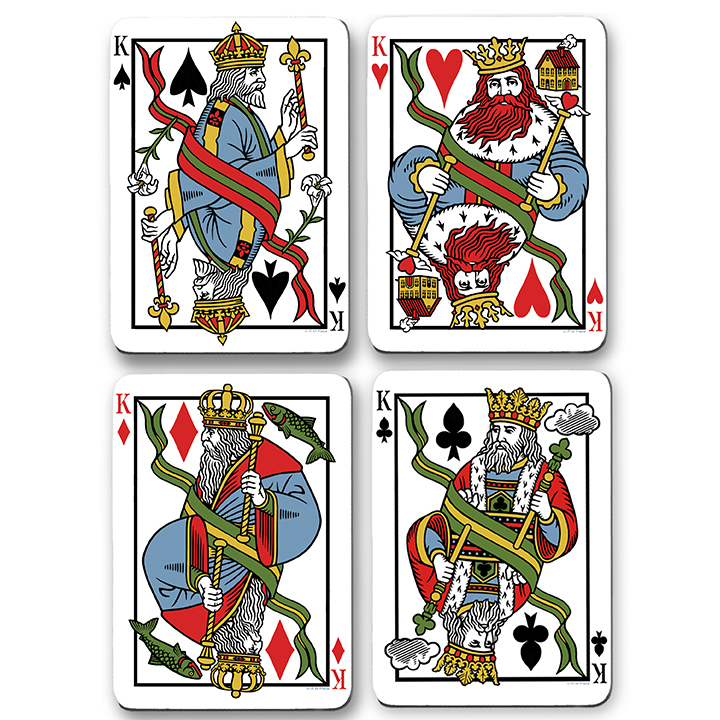 The ones on the ace, 6, 7, 8, 9, 10, and the three royal cards in each suit are the same as in the Lenormand oracle. 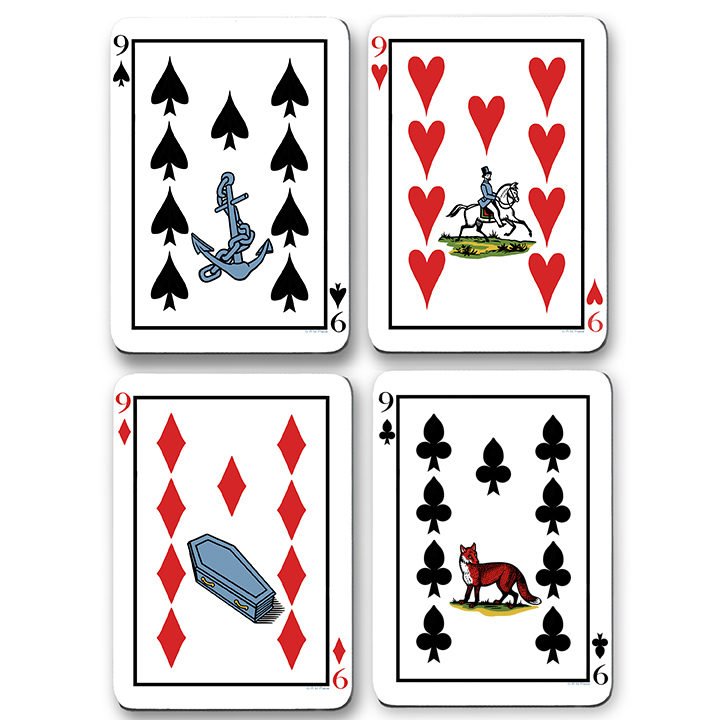 If the number 2, 3, 4, and 5 pips of each suit are removed, the deck can function as a standard Lenormand oracle deck. 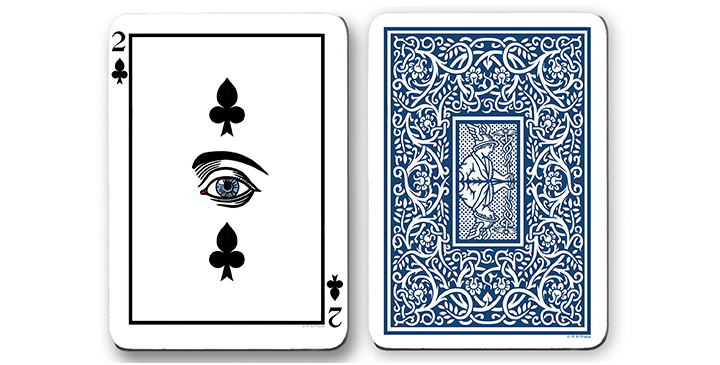 The deck can be used for any card game, but when it is used for divination, all of the cards are to be shuffled and laid out in the Grand Tableau pattern. 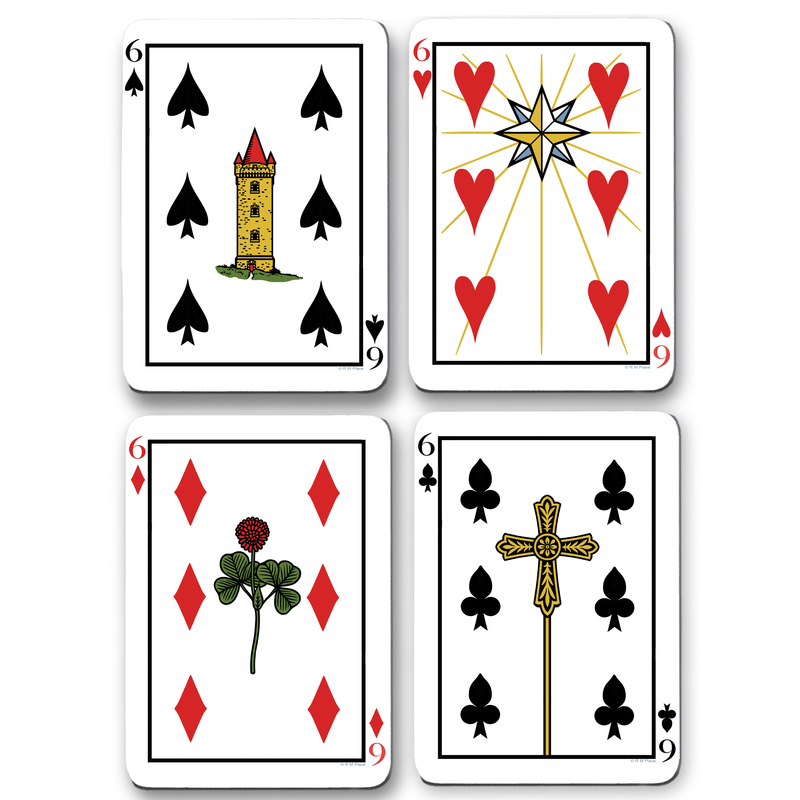 When the deck is being used as a standard Lenormand, the Grand Tableau will consist of four rows of eight cards, laid out left to right from the top to the bottom row. 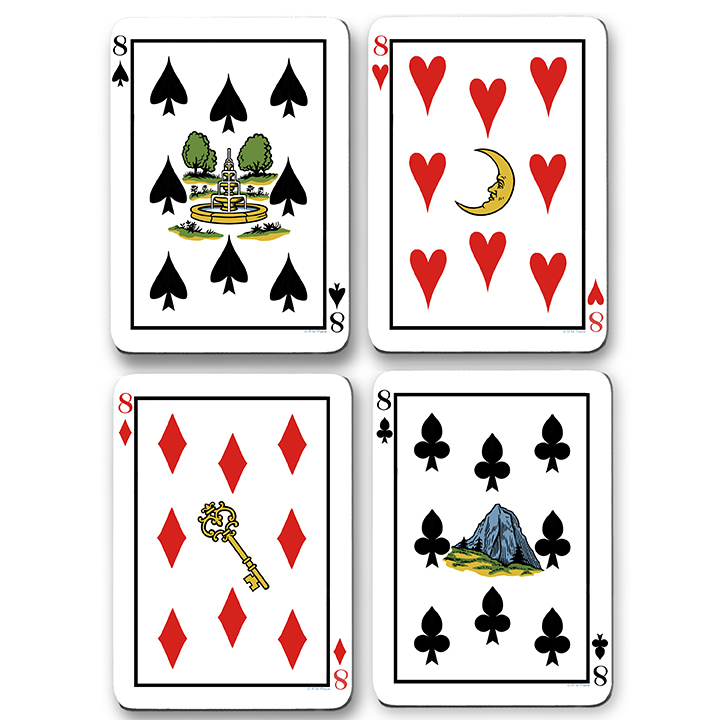 Then the remaining four cards are to be laid out in a fifth row, centered on the bottom. 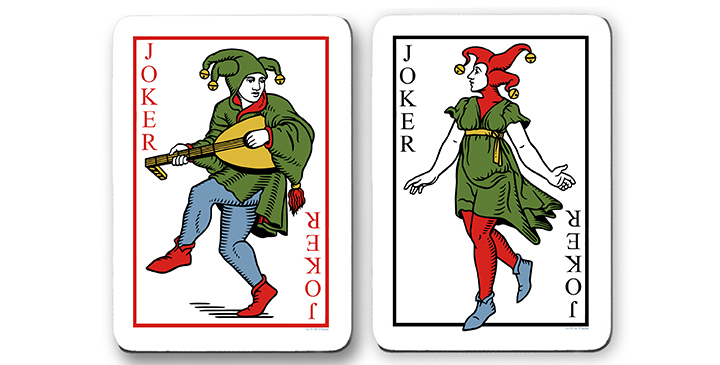 When all 54 of the cards in the deck are used, which includes the two Jokers, the Grand Tableau with consist of six rows of nine cards, laid out left to right top row to bottom. The most important cards in the reading are the significators. 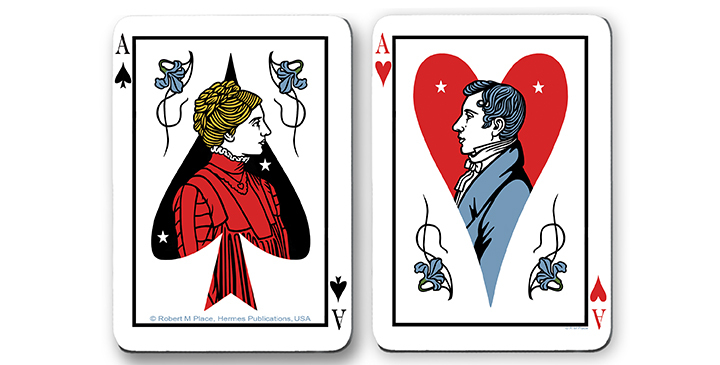 These are the Ace of Spades, representing the subject of the reading if she is a woman, and the Ace of Hearts, representing the subject if he is a man. 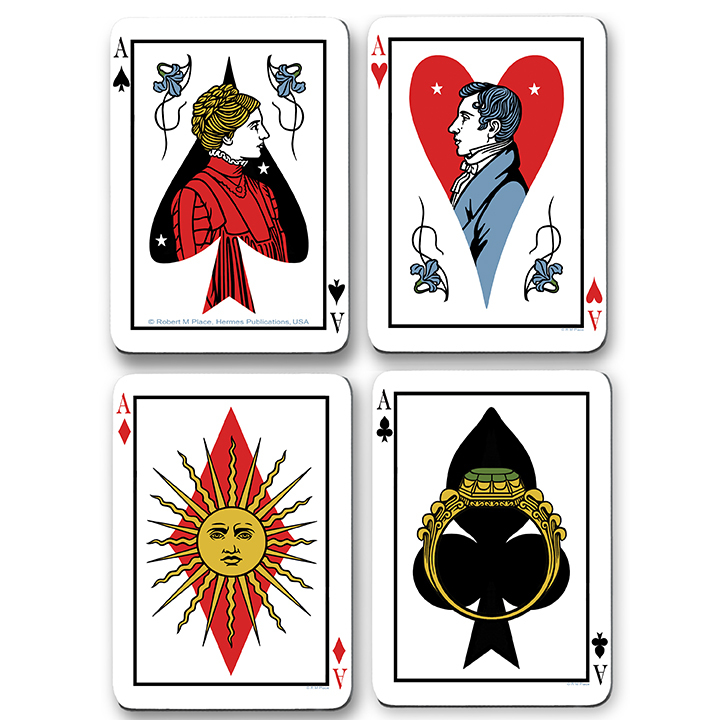 If the subject is a woman then the Ace of Hearts may represent her love interest, and likewise the Ace of Spades may serve this function for a man. This relationship is strongest when the male and female cards seem to be facing each other. If the subject is a lesbian woman, the Female Joker may serve as the love interest. Likewise, the Male Joker may serve this function for a gay man. 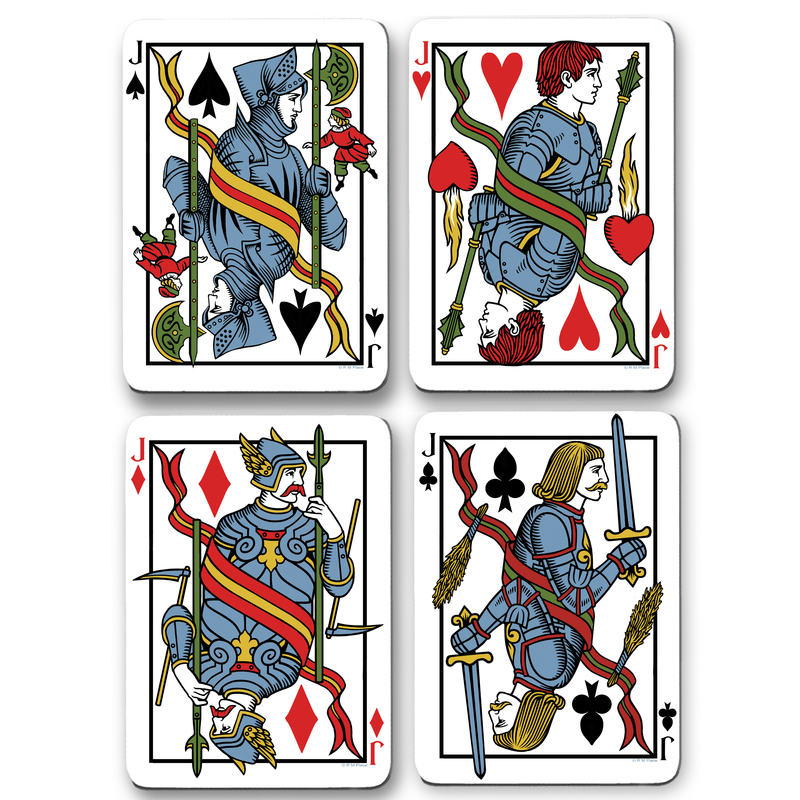 Although traditionally romantic relationships are a major focus for oracle readings, the cards may be used to divine on any subject, and the second significator and the Jokers may be used to represent others, such as friends or relatives. When reading the spread, first locate the significator and determine which way she or he is facing. The cards in a horizontal or diagonal line extending from the front of the significator (that she or he is facing) represent the future. The cards extending horizontally or diagonally behind the significator represent the past. The cards in a vertical line directly above and below the significator represent the present. Cards below the significator represent issues that have been mastered by the significator and ones above still present a challenge. The cards closest to the significator are the strongest in the their influence and the ones further away are the weakest or most distant in time. Also pay attention to images that are facing the significator and therefore moving toward her or him, also ones that are facing away and moving away. 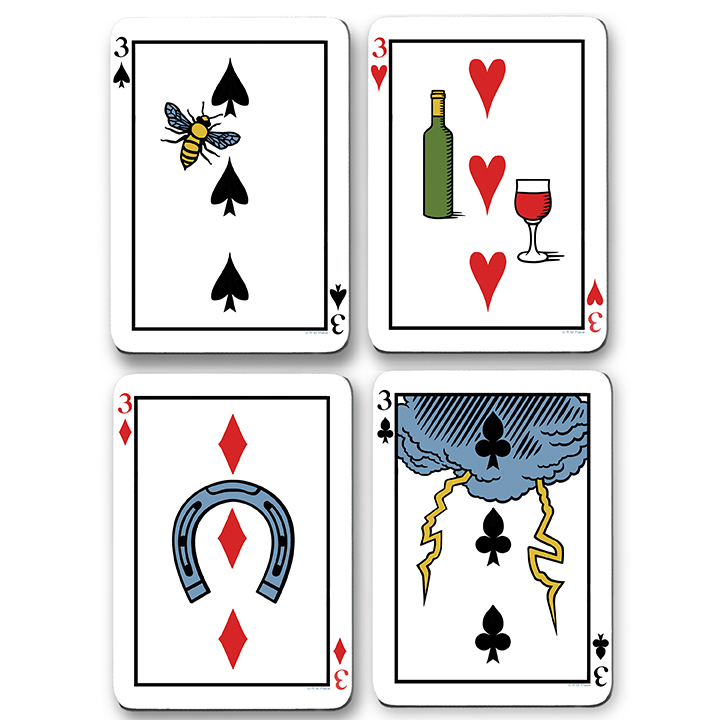 Direction is especially important when considering the King of Clubs, with the Cloud on his card. Pay attention to the cloud that appears at the top of the card. It has a dark negative side and a light positive side. The dark side will weaken or obscure the card next to it. 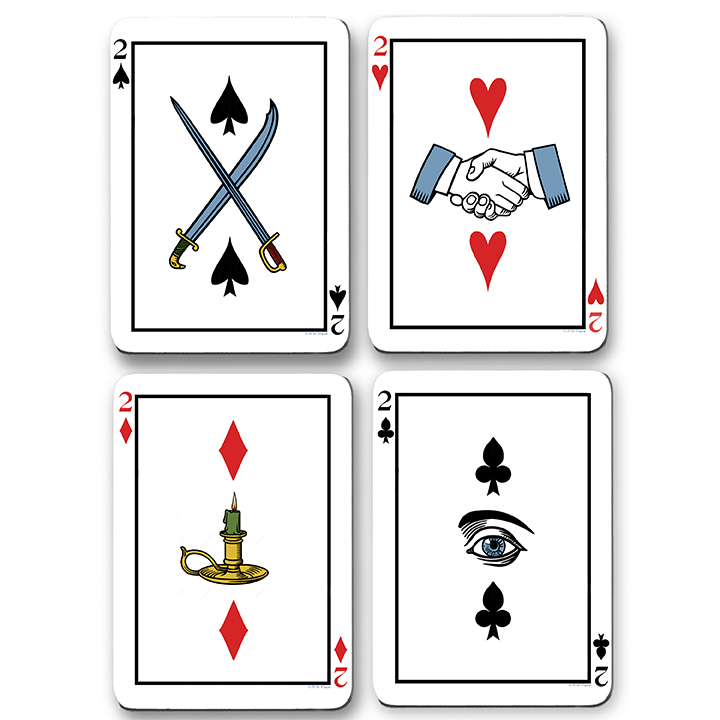 There are also layouts with fewer cards, and the cards can be used in any layout recommended for Lenormand cards. To learn more, any good book on Lenormand cards will be helpful, such as The Burning Serpent Oracle by Rachel Pollack. These are intriguing! Will be keeping an eye out for purchase info. My mother would not touch the Tarot but was incredibly gifted in her reading of regular playing cards using the Grand Tableau. I am very excited about this oracle! Looking forward to February! I sent you an email that i’d to buy some decks. Did you send it to alchemicaltarot@aol.com ? Yes, I sent to alchemicaltarot@aol.com. Did you receive or not? An email from shanghai, China. I have already paid. Please check. I will check with PayPal. What is your email address that you used when you paid?